I’ve had a very emotional week this last week. And for an unusual reason for me (I’d often be very emotional over things) but this was a first. Our dog had puppies. They arrived a week earlier than expected, and we weren’t prepared. We had planned to take our other dog out from the run, and because we didn’t, unfortunately how I realised the pups were arriving was seeing the other dog playing with one in her mouth. When I took it off her, I realised there were two already dead. 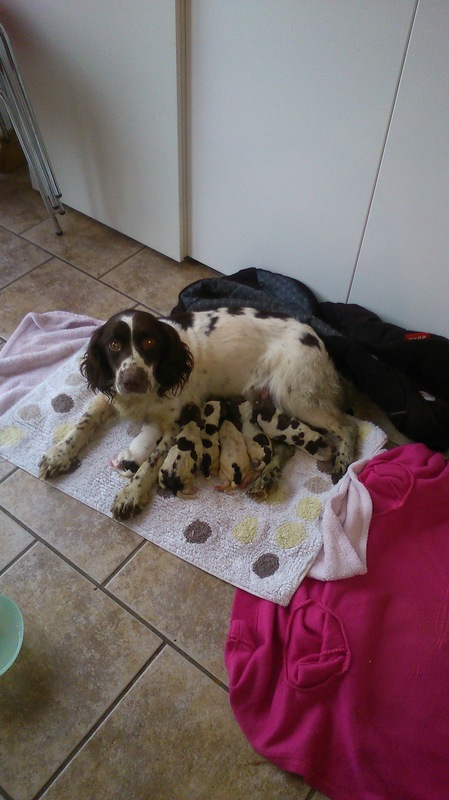 In total our dog had nine pups, two gone before I found them, and one died due to complications during birth. That was Wednesday, and we had six live pups. One by one they dropped off, and now we have only two left. The four that died were ones I was especially attached too because of bringing them in, hand warming them, trying to help feed and latch them on, and I had given them nicknames. Of course the fact that they needed extra help probably showed that they were the weaker ones. I have been avoiding having much to do with the two that are left because I didn’t want to get attached. I did a lot of research during the week, at the different stages from the birth to the aftercare and feeding, there are so many great resources out there. The kids loved the fact of the puppies arriving, but my older daughter got very upset about the puppies dying, and worried every night that more would die, so we had a lot of talking about the worry and emotions. My attachment and reaction to the pups have kind of suprised me, because I’m not an animal person in general, but I’ve really taken to the mama dog and minding her and her pups. A fellow mum I suppose! 🙂 I’ve jokingly told the other half that maybe this will be our compromise in years to come when I get broody again, maybe we can have puppies instead! Posted on March 3, 2015 March 3, 2015 by mamafeeshappyhealthyhomePosted in UncategorizedTagged broody, dogs, emotional, learning new things, loss, puppies, puppy. Previous Previous post: Wedding Planning! Next Next post: Where’s my mind gone? !